Home by Hank has some great ways to keep your kiddos entertained on long rides. Thanks, Hank! Long car trips can be very tiring and stressful in and of themselves, but if you have to battle rush hour traffic or bored, screaming children in the backseat they can be downright torturous. Unfortunately, finding new ways to help your little ones stay entertained so you can concentrate on the road can be tedious, time-consuming and create a mess of your car. Before you head out for your next road trip with kids, here are a few easy ways to keep your kids entertained, your head clear and your car clean. Take your kids to the library and let them choose a book on tape. Your local library will have (or have access to) many age-appropriate books on tape for your kids. Allowing them to help choose what they want to listen to will nearly eliminate all fuss and grumbles when it’s time to pop the audio book in your vehicle’s CD player. If your family can’t agree on anything at the library, Amazon has a wide selection of books on tape here that is conveniently organized by age group. Teach your kids the alphabet game – finding all of the letters of the alphabet on road signs, licenses plates and trucks – the person who reaches letter Z first reigns supreme. You can also try 20 questions or “I Spy” for a tech-free distraction zone. When you are driving a particularly long time, having several activities to keep the little ones entertained will go a long way to eliminating the “Are we there yet?” complaints. 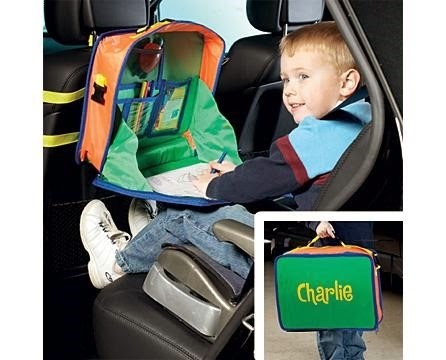 A car activity organizer, like the one found here, will help keep all of your children’s activities in one place. The fun thing about this particular product is that it unzips and folds into a lap table so your kids can color or draw on a sturdy surface. Simply slip it over the back of the front seat and your kids have access to whatever games and activities you have prepared. If you run out of non-tech entertainment, don’t feel too guilty. Consider investing in a pair of portable DVD players for your car or van. Since this technology has been available for a few years now, the prices on these items are very reasonable (remember: silence is golden). Allow each child to choose a movie to watch before switching it off and redirecting to other activities. Bring headphones for each child and you may even be able to listen to your favorite CD once or twice during your trip! These are just a few tried-and-true techniques to keeping your children occupied during a long car ride. If you have any other tips or tricks not mentioned, be sure to let us know down below in the comments! Author Bio: Hank McKinsey is a lifestyle how-to blogger and SAHD located in Central California. When he’s not at his computer blogging, he can be found at the park with his two Maltese or on the tennis court with his wife. Follow him on Twitter to see what he’s up to. Entertainment Emporium have been dazzling families all over the country for 10 years now with their amazing array of children’s party entertainment, and they are proud to say they can deliver a party to satisfy the wildest of imaginations. ...I almost lost my life when my lover of 6yrs left to be with another woman. I cried and sober every day, until it got so bad that I reached out to the Internet for help.And i saw a testimony of a spell caster who help a girl called Michelle and i said let me give it a try so i contact him for help and he cast a love spell for me which i use in getting my love back and now i am a happy woman.For what you have done for me, i will not stop sharing your good name to people out there for the good work you done for me. I hope God blesses you as much as you have help me to get my Love back, it is ideal i published this on a local newspaper for Dr in other to brings more customers to him, he worth more of this and his reward are sure. thanks and visit him on driraborspellcaster@gmail.com his cell phone number +13019098775 he is the only answer to your problems.